10-year old Dinkenesh is an Ethiopian education success story. In a worn notebook, she precisely prints today’s school lessons. This book is her greatest pride, and each page represents another day she is back in school. School is a privilege that many Ethiopian children cannot afford. Some children are needed to bring home income for families, others cannot afford the school uniforms and nominal fees necessary to step into a classroom. Fewer than half of the country’s children attend school regularly, and that number drops to 25% in higher grades. For girls like Dinkenesh, there are even more obstacles to education. Fewer girls make it to secondary school than boys, and the literacy rate of young Ethiopian women is only 47%, far lower than men of the same age. For a time, Dinkenesh joined the 130 million girls around the globe are denied access to education. I was so sad when I could not go to school. I needed to work and help my family. 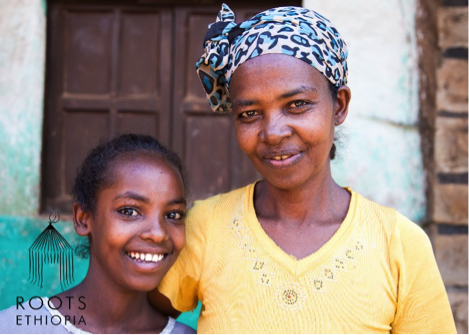 A SCHOOL SPONSORSHIP from Roots Ethiopia gave Dinkenesh the opportunity to return to school this year. For her, it’s the chance to hold a book, carefully pen English words and science terms into her notebook, while also helping out her family after school. Now I am so happy I can go to school, and still I help my mother make injera when I can. She has a lot of catching up to do. But her time in the classroom is about more than that day’s lesson. For every year she is in school, the possibilities of being literate, earning a sustainable income, holding off marriage and raising healthy children increase. Her education will be a legacy—if Dinkenesh goes to school, her future daughters are twice as likely to attend. Dinkenesh doesn’t know what she wants to be when she grows up. Her dream is right here, in this chair with a book or on a bench in her classroom, watching the teacher fill the chalkboard with new ideas. She is happy to learn and to be a part of a vibrant, packed-full class of kids who are the exception to the education crisis in Ethiopia. Dinkenesh also doesn’t know how much her education impacts the rest of her life, her family and the community around her. She may not ever know how she is connected to girls around the world who desperately want to learn, too. What Dinkenesh clearly does understand is how much possibility is on each page in front of her. She shows it by giving it great care. Join us in providing 175 school sponsorships to eager children in Ethiopia. During this month of celebrating women, we ask you to invest in girls like Dinkenesh who will change the world—one page, one lesson, one grade at a time, simply by loving the chance to learn. Your investment of $21 a month will send a student like Dinkenesh to school with all the necessary supplies—a uniform, backpack, pens and, of course, that treasured notebook. It will also provide a small nutrition support stipend to the family to ensure that children have the freedom to attend school rather than work. An annual commitment of $250 will go far in the year ahead, not just in miles to rural schools where Dinkenesh and other school sponsorship students sit at attention, but far into their big, bright futures and out into the community. Are you ready to educate girls in Ethiopia? If so, please SHARE this with others who might want to learn about the benefits of an Ethiopian education! Previous Previous post: Gooooal! Shone Youth Sports Project is a Win!